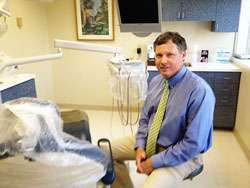 Welcome to Frederick G. Lehmann, DDS, PA, where we provide complete dental services in a caring environment. Our array of services include family dentistry, restorative dentistry, dental implants, crown and bridge single visit appointments, partials and dentures. We have proudly been serving the Chapel Hill and Durham areas since 1995. Our practice goal is to provide complete dental care services in a comfortable and caring environment. Our staff will work towards your complete comfort and understanding of all treatment options available. We offer flexible scheduling with excellent time management in a small individual setting. We take great pride in delivering excellent care with an emphasis on cosmetics and function. The patient’s comfort before, during, and after treatment is our primary concern. Contact us today to make an appointment!